So this is the part where you ask me if I’m just repeating recipes on you. And then I answer: ummm, lemme think. Okay, no, not really, but I still have the taste of this pomegranate wild rice salad in my mouth and dreams of the bacon and brussels sprout salad from, like, years ago in my head, so it’s only natural that this would come along. Basically these two very lovable salads of my Pinch of Yum past met and had a salad-child called Chopped Brussels Sprout Salad with Everything Yummy In The World. i.e. pomegranates (♥), almonds, bacon, Pecorino Romano cheese, and creamy honey shallot dressing with fresh orange and lemon juice. 99% sure I just drooled as I wrote that. Coincidence that this is in time for Thanksgiving? Negative. I know I already talked about how I am bringing the corn pudding this year like a good Midwestern wife, but I forgot to tell you that I’m also bringing the brussels sprout salad. Seriously, who am I? I’m in that sweet spot where I don’t have to host yet and I don’t have to make the turkey because my mom rocks it for all of us, and so Thanksgiving sides are my thing. And I love a good side at Thanksgiving. In case you’re interested, this is how cool Brussels sprouts look when you shred/chop/shave/mandoline them into thin little perfect pieces and wash them in a big blue bowl of water. I almost can’t stand to think of eating them any other way. This is not just me puffing out my feathers here, except only a little, but EVERYONE in my family likes this. Er, I know for-surely for-surely they’re going to like it because they all polished off the bacon and brussels sprout salad that I brought a few years ago to some holiday feast. It perfectly compliments whatever you’re having as a main dish including our holiday family favorite: chicken wild rice soup. Hey btw. 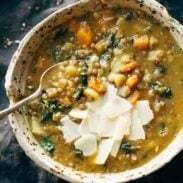 I did not intend for this post to be a link landmine when I first started writing, but, FOOD. The win-win of this situation is that this is a salad made for holidays because it’s completely festive-ish, but it also makes for a great weeknight meal being that it comes together in a snap and packs a ton of nutrition. And/or just because it’s delicious and you want to. 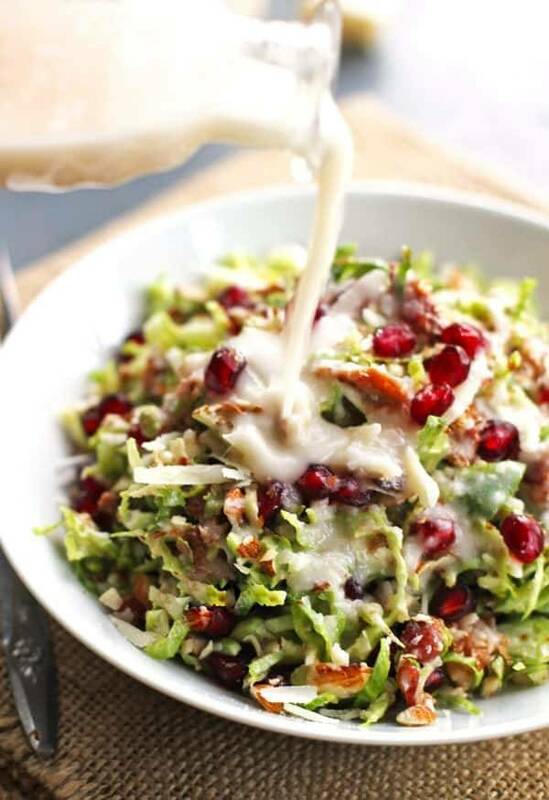 This chopped brussels sprout salad has pomegranates, almonds, crumbled bacon, and homemade creamy salad dressing. Perfect for a healthy holiday dish! Fry the bacon over low heat until crispy. Drain on paper towels; crumble and set aside. Shred or slice the brussels sprouts. I’ve found the absolute best way to do this is with a handy dandy mandoline – slice them super thin and then break the layers apart with your hands. Fluff it up a little and you’ll get a delicate shredded texture. Prep the pomegranate seeds. Place the almonds in a food processor and pulse until finely chopped. Toss the brussels sprouts, bacon crumbles, pomegranate arils, almonds, and cheese together. Place all the dressing ingredients in a food processor and pulse until creamy. Add the water as needed for consistency. Toss the salad with the dressing and serve immediately. Brussel sprouts are awesome! I have recently discovered pomegranates; what a find. Can’t wait to try this dressing! This looks absolutely delicious! I am a big fan of brussel sprouts and pomegranates together, I am most certainly trying this out. This is so perfect!! And Pretty! And I really want it! I will be stacking this a mile high up on my plate!! In, done, sold! I will even painstakingly chop chop chop for this gorgeous rainbow of salad goodness. Also, I’m all about the link love. It’s one of the best food times of the year, so bring it on! Wow this dressing looks to die for! And I know exactly what you mean about being in that “sweet spot” where you’re not hosting holidays yet ha! Have a great turkey day! Sweet spot aka lazy spot. 🙂 Hahaha. I’m a bit of a brussels sprouts fanatic right now. I’ve made roasted sprouts with bacon twice within the past month. This salad is right up my ally, especially with the addition of pomegranate. Thanks for the recipe! Giving brussel sprouts a good name. Well done. This looks stunning. I love Brussels sprouts but they are a little out of fashion in the UK where we can expect a plethora of recipes in the next month that will be all about how to disguise them as much as possible. Perhaps if people saw this it may spark a change of mind. Have never seemed them on restaurant menu here other than at Christmas. Kale is probably more popular at the moment but still not as much as in America. I think we may possibly just be a nation of reluctant veg eaters! So much goodness here. LOVE this salad! p.s. beautiful inspirational photos – was just introduced to your blog today by a friend and I love it! I just had an amazing Brussels sprouts salad this weekend at a Bobby Flay restaurant. It was so good and I want to have more. I am definitely going to try yours out. Love Brussels Sprouts. Ooh fun! How were the sprouts done – shaved like this? It’s really the only way I like to eat them. The texture is SO good! Hmmm…this might just get me to eat brussel sprouts!! This salad looks delicious! I love that dressing. I love brussel sprouts, but I’ve never had them raw before. I put pomegranate in my parfait this morning, went to work, and realized I had pomegranate juice all over my shirt from getting the seeds out. Oops! You would love them raw! It’s the only way I like to eat them. Even my younger brothers (10 and 16) loved this salad. You had me at bacon! 🙂 see you at Christmas! Yayy! So excited to see you! Are you bringing sushi? This looks fantastic! I really want that dressing! Seriously, I love your writing as much as your recipes. Is it still there? I just may do that. i love madly pomegranate and in this recipe pomegranate and sprout salad just mouth watering combination. you are perfect. Wow, this looks amazing. I will be making this very soon! Thanks for the recipe! I’m chuckling here. I love that you called it a “link landmine”. Why not?? I am the side dish gal too – although I get stuck with potato dishes mostly. I want to bring something light and vegetable-y this year. . . maybe this will be it!! I think I’m in love… Oh my goodness who can pass on brussels sprouts, with bacon and pomegranate smothered in a creamy dressing… Totally just drooled all over my lap top! I don’t even like brussels sprouts but I’d have no problem DEVOURING this! i want to put this inside of my face. Oh I love that idea. Thanks for sharing!